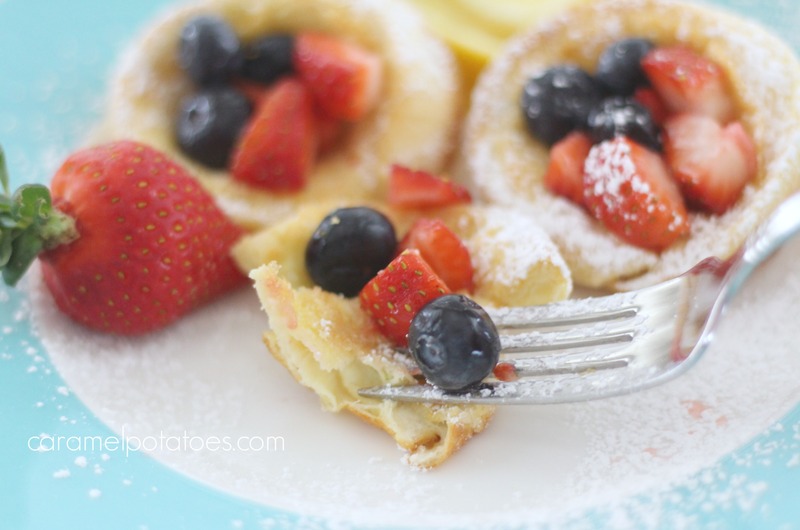 Dutch Baby Pancake, Dutch Puff Pancake, German Pancake, Oven Pancake- no matter what you prefer to call this pancake, it’s one of my breakfast favorites. It’s light and airy with amazing buttery-crusty edges. This is a breakfast that is easy, but always provides the wow factor. 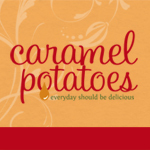 Mix the batter in the blender and pour it into a hot pan of melted butter – it’s that easy, and that good. 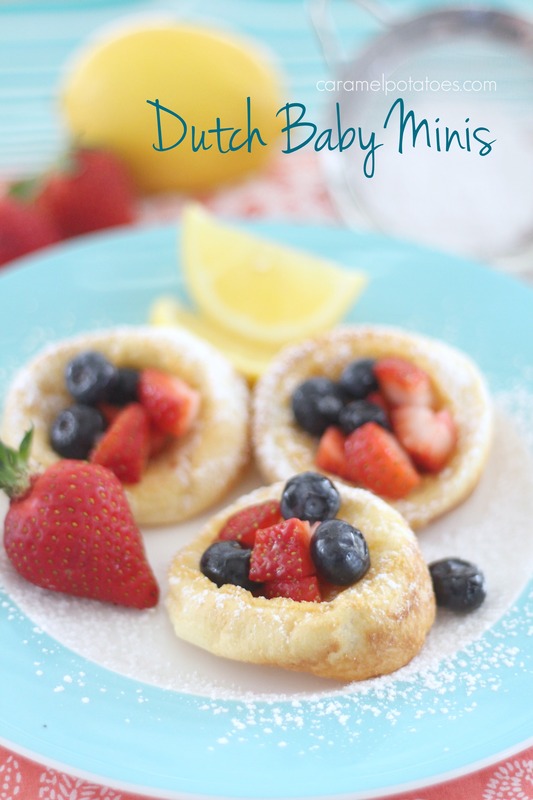 Usually we bake one large pancake in the oven*, but I thought these Dutch Baby Minis would be a fun idea for Easter brunch. 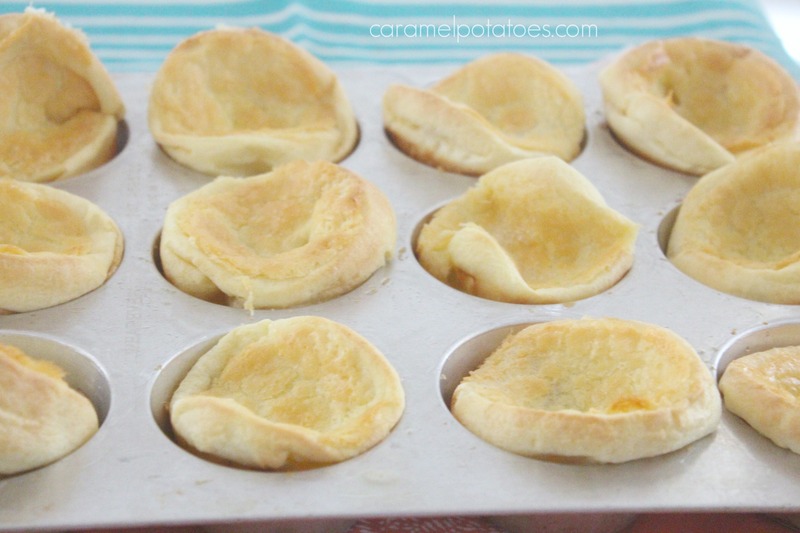 By dividing the batter into muffin tins you get these fun individual servings. Of course watching the pancake puff up and turn golden brown is part of the fun. Fresh fruit is always fabulous on the pancakes, but my boys favorite was always just more butter and powdered sugar. There is no wrong or right way to each these gems. Some other great ideas are, Fresh Blueberry Sauce, our favorite Buttermilk Syrup, jam, marmalade, or just a squeeze of fresh lemon juice and powdered sugar. What’s your favorite way to enjoy your Dutch Baby? Combine fresh berries with a sprinkle of sugar and a squeeze of fresh lemon juice. Allow to sit while you bake the pancake. In a blender combine the eggs, milk, flour, and salt. Blend until smooth and foamy. Pour evenly into the prepared muffin pans. Bake for 14-18 minutes or until the pancakes are puffed and golden brown. The Dutch Babies will puff up tall around the edges and then fall when you take them out of the oven. Remove from pan and sprinkle with powdered sugar and top with fresh fruit if desired. Makes 24 mini Dutch Babies or one 13×9 pan. *NOTE: To make one large Dutch Baby or German Pancake, Place the 6 tablespoons of butter in a 13×9 pan to melt while oven preheats. Pour the batter into the pan and bake at 400 for 20-25 minutes or until edges are puffed and golden brown. Hello! Thank you so much! I look forward to grandchildren, to make such a beautiful and tasty pancakes for them)!